Kali Sindh River flows through central India and it is a tributary of the Chambal River. It is one of the principal rivers of Central India and Rajputana. In Hindu religion, the river finds mention in the Puranas. Brahmanda Purana refers to the geography of Kali Sindh. It is also mentioned in the Malavikagnimitram of Kalidasa. The famous battle between Vasumitra and Greeks were fought on the banks of Kali Sindh River. Vasumitra emerged victorious in this war. The major part of the river flows through Malwa region, the Avanti Mahajanapada of ancient India. Avanti is widely mentioned in all Hindu Puranas and epics. Origin of Kali Sindh River is in the higher reaches of the Vindhya ranges in Madhya Pradesh. It flows about 290 km through Dewas, Sonkatch, Shajapur and Sarangpur in Madhya Pradesh. Later it enters Rajasthan and flows through Jhalawar and Kota districts. It falls into the Chambal River after running 362 km from its source. The slopes of Kali Sindh are covered with boulders of basalt. Dhak shrubs, date palm and dry teak are found along the banks of the river. 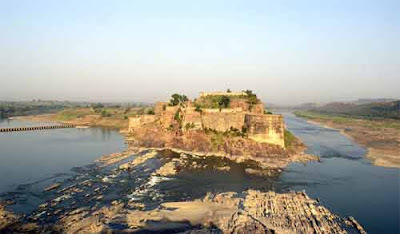 Gagron Fort is located at the confluence of Kali Sindh and Ahu River. Several Shiva temples are located on the banks of Kali Sindh River.